Up to 7 guests can enjoy wonderful views overlooking Troon golf courses and explore the spectacular surrounding Scottish countryside and coastlines. 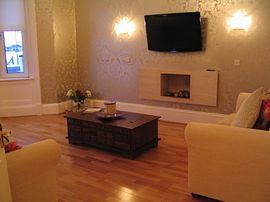 At this holiday home you are perfectly situated for Home Coming Scotland 2009 and Turnberry, venue for the 138th British Open Golf Championship 2009. Troon has a wide range of amenities including shopping, restaurants, recreational facilities such as Royal Troon Golf Course, Seafront and Yacht Marina. Troon railway station and the newly upgraded A77/M77 now provides easy access to Ayr, Kilmarnock, Glasgow and surrounding districts. Prestwick International Airport offers flights to most major destinations throughout the UK, Ireland and Europe. Generously proportioned with stunning golf course views . 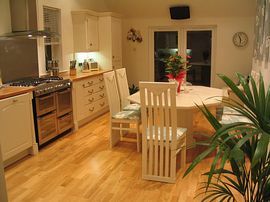 Fabulous 24ft dining kitchen - French doors to rear garden. A good sized front garden with a chipped driveway offering ample off-street parking & spectacular views over the golf course. 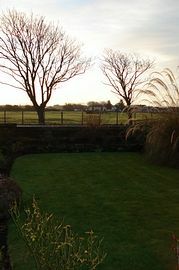 The rear garden, which can be accessed from the dining kitchen French doors & the side walkway, has mature shrubbery & a lawn area. 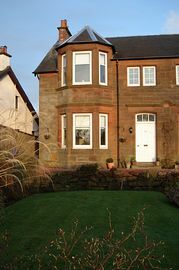 Local Services: Harling Drive is less than a mile from Troon town centre, a short walk the beach at Troon & Royal Troon Golf Club and a short drive from Culzean Castle & Burns Cottage. Troon has a wide range of amenities including shopping, restaurants, recreational facilities such as Royal Troon Golf Course, Seafront & Yacht Marina. Troon railway station & the newly upgraded A77/M77 now provides easy access to Ayr, Kilmarnock, Glasgow and surrounding districts. Prestwick International Airport offers flights to most major destinations throughout the UK, Ireland and Europe.